The SINGPHO society is not as complex as of other tribal societies. The SINGPHO society is divided mainly in 3(three) groups such as SISEN, N’KHUM and MIRIP which is further divided into a number of clan each under a chief. The clan organization is based on lineage or sub-lineage group. Chieftainship is an important feature of Singpho society. The Singpho family system is patriarchal and live in a joint family. But now-a-days with a changing situation the family is slowly and gradually braking up from joint family to a single family, as the married sons establish separate household. The Singpho women are expert in weaving and they make their own dress themselves. Up till now women are using hand-spun and prepared home-made dresses. 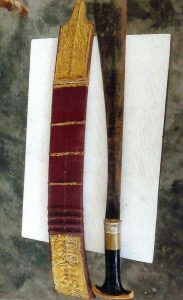 Machette (Dao) of Ningru Samown Singpho which is 300 years old.